My debut solo EP Gerri Jäger live at Vrooom is going to be released on the 20th of april 2019. The music is recorded live at the concert series Vrooom in Rotterdam. It will be released in form of a handmade limited edition cassette tape including a download code. It will be the first release of the new Amsterdam label Flop Records. The digital version will be stream- and downloadable via http://gerrijaeger.bandcamp.com. Little video of the 1st try-out of my new solo set at STEIM Amsterdam filmed by Raoul Jose Hilbink. Booking a little EU tour with my Solo Project teaming up with steaming Spinifex. We’re looking for concerts in Germany, Czech Republic, Austria, Slovenia, Northern Italy and Switzerland between 8th and 16th march 2019. Let me know if you’d like us to play at your favourite venue! New Knalpot videoclip for our track “effe zitte” from the album Dierendag (Shhpuma/Clean Feed) released on October 3rd 2018. Major thanks to Alek and thanks to Volkshotel Amsterdam for providing the location. Invited to do a 3 day residency and presentation at STEIM with a new project called Grafwerk. We develop new work for live set-explorations. This is a duo of two drummers: one playing percussive sounds with an electronic instrument, and the other playing electronic sounds with an acoustic instrument. Interview with Pat Cleaver of Sound of the Moment. Also a mini documentary of Knalpot made by filmmaker Nicola Cavalazzi in the making. New Knalpot music video in the making! thanks to filmmaker Alek Riquelme. ALSO our new album Dierendag will be released on the 3rd of October and presented live at the Bimhuis Amsterdam and LantarenVenster Rotterdam. 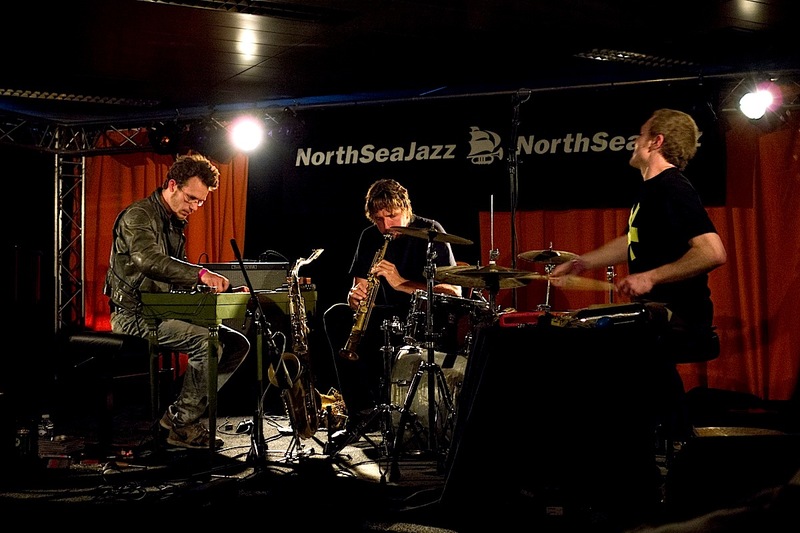 Big pleasure to wrap up the season with a concert of my group STUG at the North Sea Jazz Festival. Thanks to everyone who has been part of it. Playing a bunch of shows with Tin Man & the Telephone and the Peergroup in the location theater piece Missie zkt. Massa written by Peter Vandemeulebroecke & Ko van den Bosch. The new and last Rooie Waas album out on vinyl and bandcamp. A new and last album of Rooie Waas. We decided to quit but will celebrate it with a new live-set and a 12″ limited edition silk printed record. Preparing a new solo set for Modern Body Lab #2 concert in The Hague. I set up a little online DIY record store. Shipping is worldwide and fast like a pigeon. I will add a little personal note or well meant amateuristic drawing to each sold album or EP. 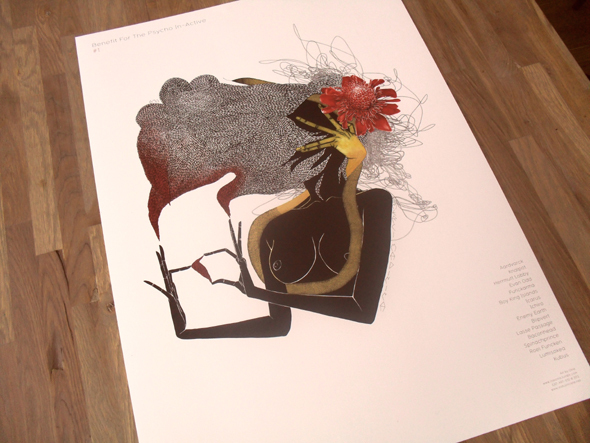 Some are almost sold out by the way. Take a look. Interview & recording of the concert of the Carte Blanche concert on Bimhuis Radio. Review of my carte blanche concert at the Bimhuis last week by Peter Bruyn for FRNKFRT. Trying out new improvisation frames and compositions with a brand new project warming up for my Carte Blanche Night at the Bimhuis. Creating music for my upcoming Carte Blanche night at the BIMHUIS. I’m not sure yet if this one gonna make it but for sure had fun playing it. Please save the date 22nd of november. Recording the new Knalpot set at the ever dope Zwarte Molen Studio Amsterdam. We have been composing a new set with KNALPOT which we will present at one of our favourite festivals: Satta X! Playing on august 11th, alongside Kelpe, Sheep Got Waxed, Despotin’ FAM, Lawrence le Doux and many more. Looking forward to back to Lithuania! Grateful to be invited for an artist in residence at the Worm Studio in Rotterdam. Album four of Rooie Waas is coming closer. Thanks so much to Lukas Simonis and the whole Worm institute. I got invited to do a Carte Blanche evening at the BIMHUIS. For that occasion I managed to put together two quite super groups. The first one will be a quintet with Sofia Jernberg (voice), Joachim Badenhorst (sax/bcl), Raphael Vanoli (gt), Petter Eldh (bass) and me on drums. Last year we played together for the first time at the October Meeting Showcase Festival and it was just great. The second set will be a quartet with Giray Gürkal (gt), my long time Knalpot mate Raphael Vanoli (gt), killer Frank Rosaly (dr) and me on drums. Further I can confirm that Sandor Caron will do the sound engineering and tasty Meeus van Dis will care of the light design and filmmaker Ellenoor Bakker will project a short film. After the concert Juha will DJ! filter & distortion experiment. work in progress. Coming Sunday January 29th (15:00) our new nonet Qubit Philharmonic will debut at De Ruimte! Felicity Provan, Eric Boeren, Joost Buis, Michael Moore, Natalio Sued, JanWillem van der Ham, Jeroen Kimman, Wilbert De Joode, Gerri Jäger. Please come! New experiments with our duo KNALPOT putting our compositions aside and rediscover the world of improvisation. For a special occasion we invited the special musician and friend Jozef Dumoulin to join our concert at this year’s Stranger than Paranoia Festival. Last 3 performances of the work intensive music theater piece Everyman performed six times in a hidden hall at shopping center Hoog Catharijne at the trainstation in Utrecht. The music is written by friend and guitar-/bass player Raphael Vanoli. I’m happy & proud to announce that the second Naked Wolf album is out on Cleen Feed Records. Thanks so much Kasper Frenkel for the recording, Sandor Caron for the mix, Zlaya Loud for the mastering, Travassos for the design and Pedro Costa for the executive production. New solo set-up and material in the making. Thanks to Lukie Roots for custom-building a Coron DS7 drum synth clone for me. Live video recording of a new solo piece at Studio De Zwarte Molen Amsterdam. Thanks loads to Carlos Dalla-Fiore for initiating, directing and editing, Bas Melis for the audio recording, Sandor Caron for the audio mix and Ellenoor Bakker & Gijs Borstlap for filming. Bit delayed but very positive review about my solo-set at the REWIRE Festival (by Rene van Peer). Live video shoot of a new solo piece at the great Zwarte Molen Studio. Soon i will post it on this site. Happy to be invited to be invited to play at the Rewire Festival and the FAQ Festival with my new Solo Project. Both shows will be supportet by Knalpot’s sound-man Sandor Caron. Recording a new Naked Wolf album for Clean Feed Records at the awesome Electric Monkey Studio. Preparing for some upcoming solo performances using drum-set, 2 synthesizers, casio keyboard, delays, reverb, loopers and distortion. On sunday the 13th of december I will play some of my favourite mp3’s at the Oedipus Brewery in Noord bewteen 5 & 7pm approx. Rediscovering my Synare drum synth. Also using a little distortion, delay and freeze pedal. Thanks to Luc van Weelden for modding both synth & gate pedal. Happy to announce the release of the first album of the project Sgt. Fuzzy from Antwerp. It’s recorded with Ruben Machtelinckx (Hilmar Jensson) and Bert Dockx (Dans Dans) on guitar, Nathan Wouters (Jef Neve Trio) on bass, me on drums and Thomas Jillings (Linus) on tenor, EWI & compositions. The 3rd Rooie Waas album will come out during our album release concert on the 29th of october at the Melkweg in Amsterdam. Very happy to be back behind the drums playing with all my limbs after a nasty thumb injury. Maybe see you at one of my upcoming concerts. Photo by Maarten van Haaff @ TivoliVredenburg June 2015. I broke my right thumb 😦 but probably/hopefully will be back on stage in june. Two pieces of my try-out of my drums & synthesizers solo set from last month are online. Filmed by Gijs Borstlap & recorded by Sandor Caron. Preparing a solo set for a concert at zaal 100 on the 25th of february using a sequencer and my Knalpot electronics. Recording an album with a new project: Yedo Gibson Trio feat. Ab Baars playing new arrangements of Misha Mengelberg’s music. Our band NAKED WOLF has released its debut album on Belgian label El Negocito! We’re happy & proud about it. Big thanks to label boss Roge Verstraete, Kasper Frenkel from Electric Monkey studio, producer Zlaya Hadzich, Sandor Caron for mixing, Dagoose for mastering and Dries Verstraete for the design. One can order it via the label or via our bass player’s online shop. I am pleased that for the 2nd time Bandwidth is releasing an EP featuring me as a guest. This time in form of a cassette tape and digital downloads. Thanks to Clemens Hausch & Moozak Records it will be launched on the 26th of November at the FLUC in Vienna. Article about my groups and projects written by journalist Vera Vingerhoeds. 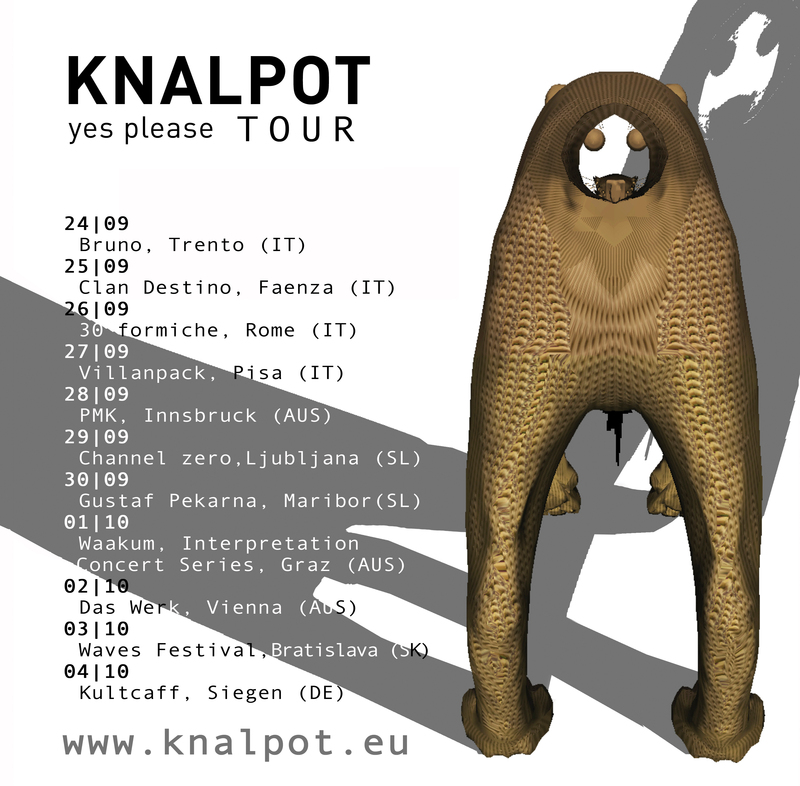 Finally touring again with KNALPOT promoting our new album Yes Please! Extra BIG UP to our musical supporters Marco di Gasbarro for his advanced drum solo prior our concerts in Italy and lovely DJ Asthma Attack who framed our set with the most adventurous mixes ever. 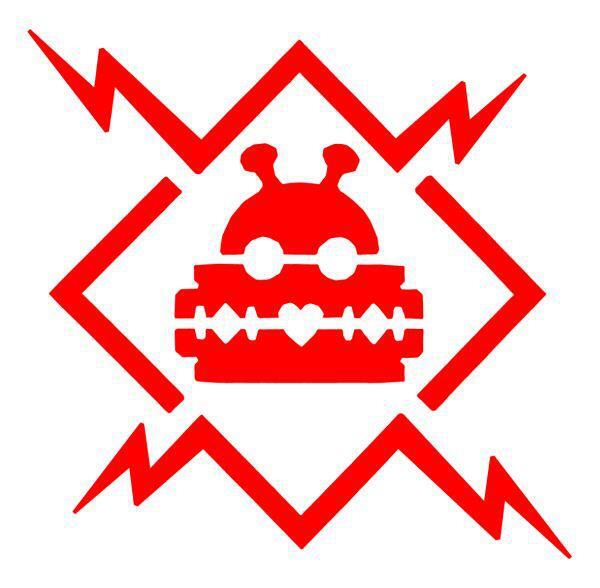 Rooie Waas will play at the Lowlands Festival in Biddinghuizen on the 15th of August 2014. To celebrate this our label Blowpipe will re-release our album NU on CD. 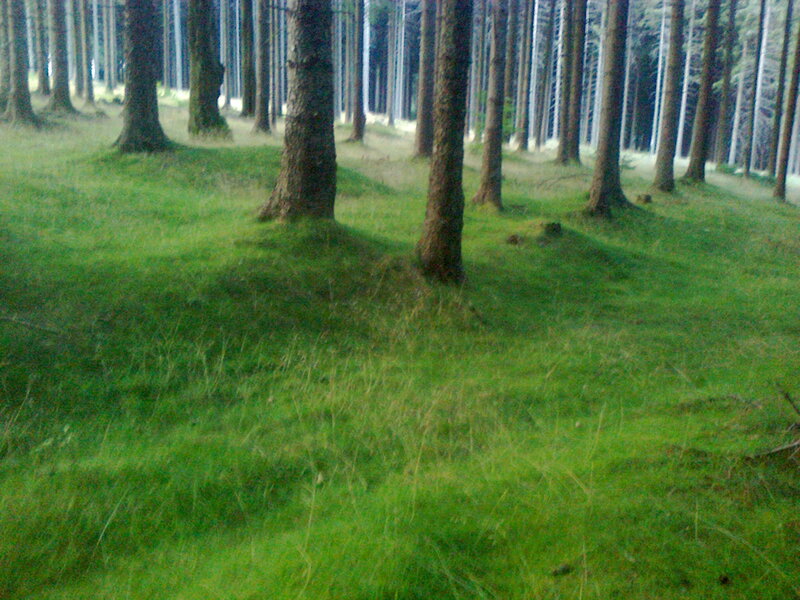 Tree week artist residence composing period at Saraswati Studios on the countryside of Poland. Thanks so much to Raj, Kamila & Janek for the support. 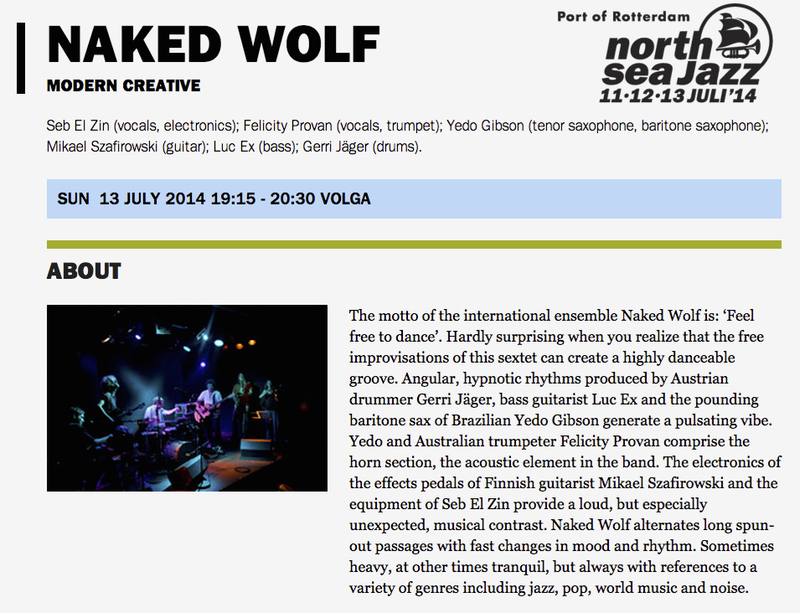 We play our first official Naked Wolf concert with our new singer Seb El Zin from Paris at North Sea Jazz Festival in Rotterdam. On the 4th of june the new KNALPOT album will come out on EAT CONCRETE Records. Listen to snippets and pre-order on the site of our label Eat Concrete. The release concert will take place at the Paradiso Amsterdam on the 27th of june. We made a remix of a Death Grips track with Rooie Waas. Knalpot’s new album will be released on Eat Concrete Records on the 4th of june 2014. 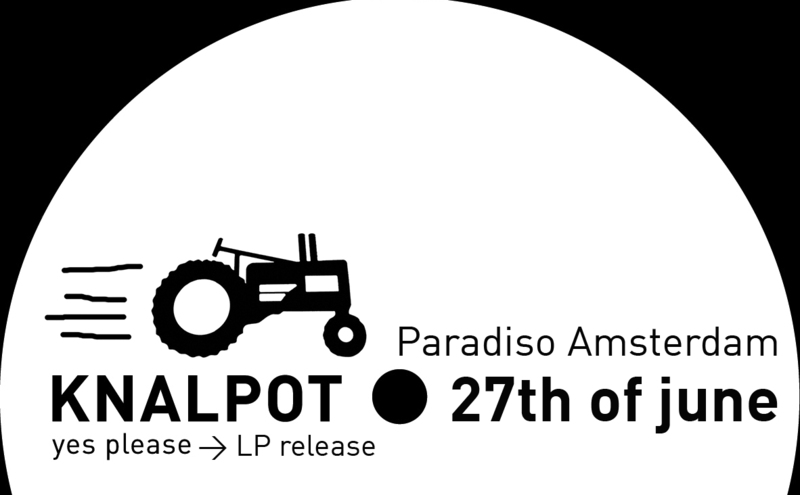 The live release show will take place on the 27th of june at the Paradiso Amsterdam. 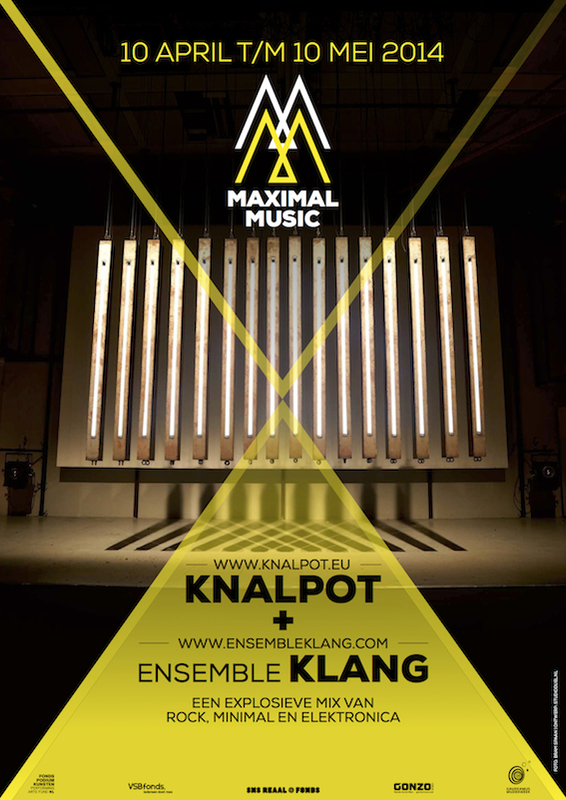 On the 10th of april we will premier with Knalpot our new collaboration with Ensemble Klang called Maximal Music. We composed new music for this line-up and are quite excited. 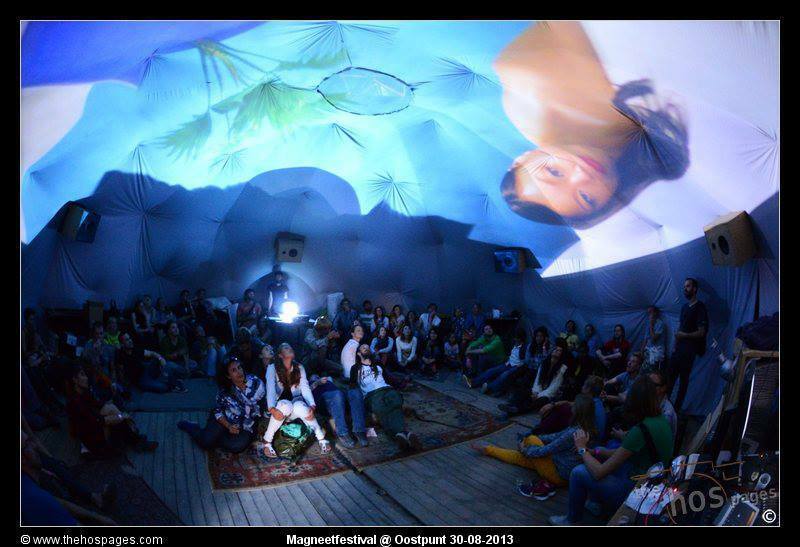 Visuals made by Martha Colburn & light design by Meeus van Dis. Hope you all can come to one of the shows! Happy to announce that the KNALPOT debut album “yes please” will be released on vinyl by one of our favourite record labels EAT CONCRETE (distribution by Rushhour). The official release date is the 4th of June 2014. New Bakker, Goudsmit & Jäger music video thanks to Vera Broos from the Meertonen Project. 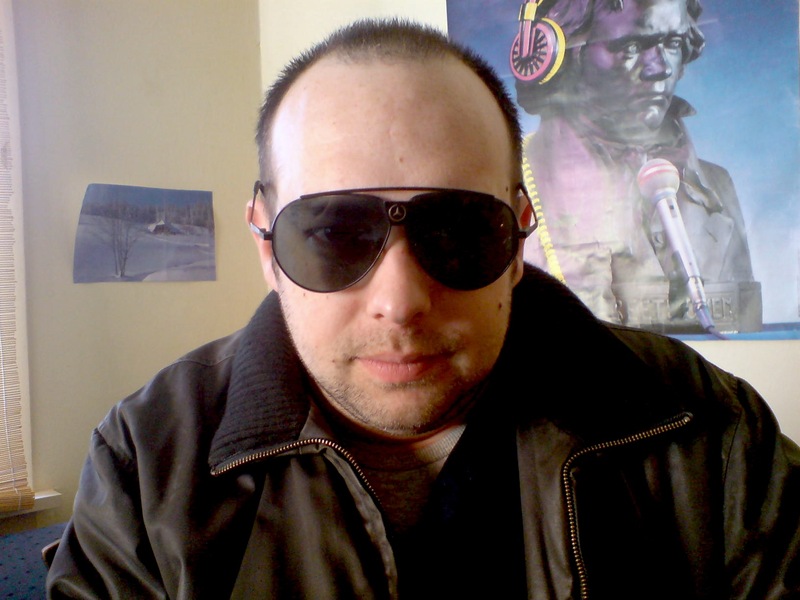 The music is recorded at the Warning Studio by Bjorn Warning. New Rooie Waas music video: hope you dig! thanks again Mr. director Pablo van Wetten. The new album will be presented live at WORM in Rotterdam on the 2nd of february and at OCCII in Amsterdam on the 6th of february. mixing new Naked Wolf album with good old friend and partner in crime Sandor Caron. it already sounds good thanks to him, the musicians, Zlaya Loud and the super Electric Monkey Studio Amsterdam! Knalpot DUB project live at Steim’s Winter Party (with Rosa Menkman live visuals and Carlos Dalla Fiore dubs/processing), filmed and edited by stillman. the new video clip of Rooie Waas “doe niet zo moeilijk” is done and NICE and will be released early next year. Thanks one more time to Pablo van Wetten! 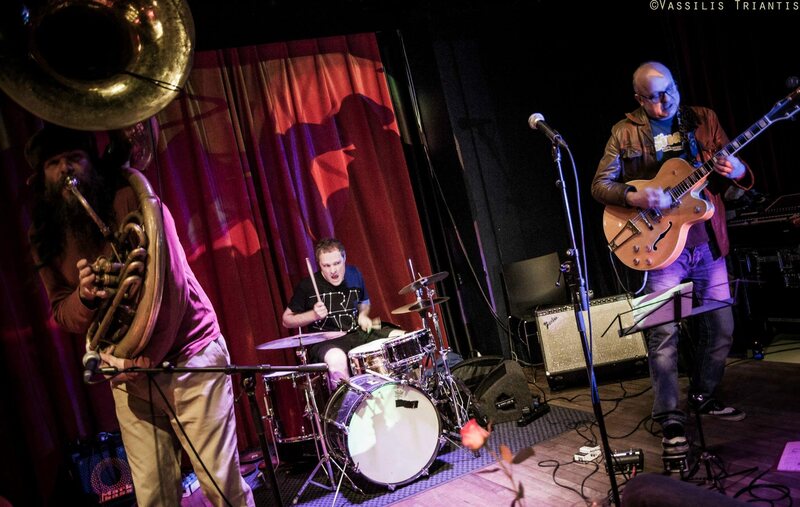 the first concert with Anton Goudsmit & Arno Bakker at the Amsterdam Jazzfest was dope. Probably we will perform again. tryout of KNALPOT DUB at the valreep last week went great playing dub versions of our repertoire. more of that will follow. thanks to awesome live dubs of producer Carlos Dalla-Fiore (studio de zwarte molen). also big ups to an inspiring into-your-face set of our friends Germanotta Youth from Rome. funny nice article “The art of resistance” about the 1st Rooie Waas album in the The Post Online (in dutch). excited to play in Russia again with Knalpot. This time in Moscow (Platforma/Vinzavod) at The Night Of The Unexpected Festival on the 18th and 19th of October. Eat Concrete our label of our debut EP just released the compilation ‘Benefit For The Psycho In-Active’ feat. one KNALPOT track (AV3) plus Aardvarck plus an Icarus remix & many more. 100 Posters (A2 format) Digital release (mp3/flac). Limited FREE mp3 available via the eat concrete website! am super happy as we finished the mixes of the new Knalpot release, our full length album! big big up’s to our Raphael Vanoli, Sandor Caron and our partners in crime Bas Melis & Carlos Dalla-Fiore of Studio De Zwarte Molen and Ranjit Prasad & Roli Mosimann of Saraswati Studios. excited to play another solo set this month: 13th september at the magneet festival amsterdam, pirate cinema (dolby 5.1 surround sound), supportet by visual artist Pablo Dias. start: 5pm. 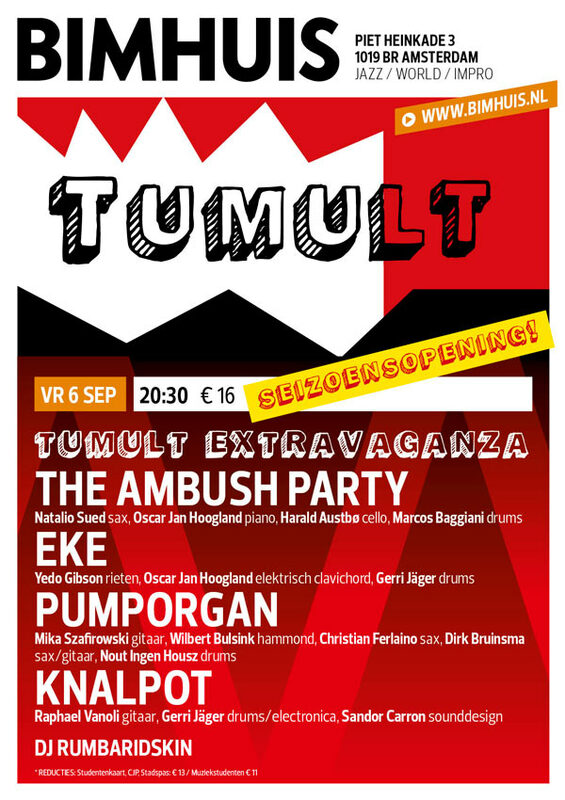 we are opening the new club concert season at the BIMHUIS Amsterdam on friday the 6th of september with an big line-up of TUMULT bands. mixing the new album of Knalpot. 3 years of work will be finished soon before the search for a suitable record label will start. any ideas are welcome.